In articles about the differences in clothing and gear used by cowboys in different regions, the buckaroo is usually portrayed as a caricature from the 1980s. Modern-day buckaroos no longer wear snap-brim hats and thrift-store coats unless they find a wicked good deal on a Cabela’s cast off. Here’s a breakdown of the typical buckaroo’s attire, circa 2015. 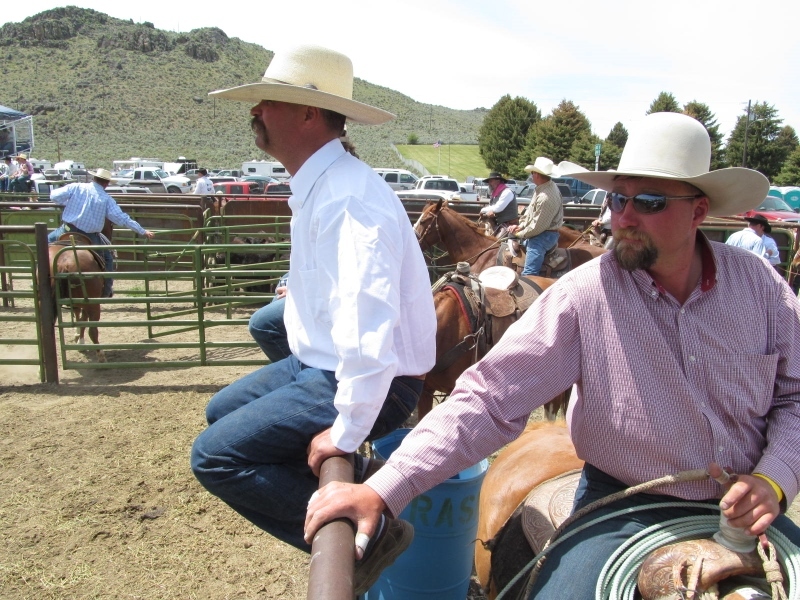 Hat: Some buckaroos wear the flat-brimmed hat that most folks associate with the Great Basin. Others add a little turned-up shape to the brim, but hardly anyone tacos it up. 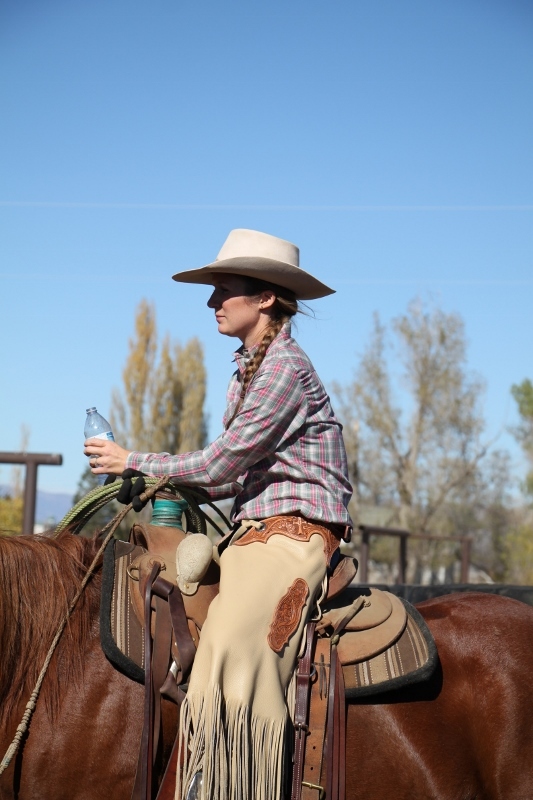 Regardless of the shape, most working buckaroos have a 100X custom felt hat that they save for town use. They might have different opinions as to what constitutes an attractive hat shape, but everyone agrees that a point of pride is a high-quality lid. Coat: A buckaroo might pack light as he moves from ranch to ranch, but he is guaranteed to always have a big winter coat. Preferences vary from down to wool to a snowboarder-grade insulated model with a detachable hood, but only a fool or a newcomer would buckaroo around the Great Basin without plenty of warm winter clothes. “Winter” can last through June, and the standard long-handle season starts on Labor Day. Knife: All cowboys carry a pocketknife, of course. 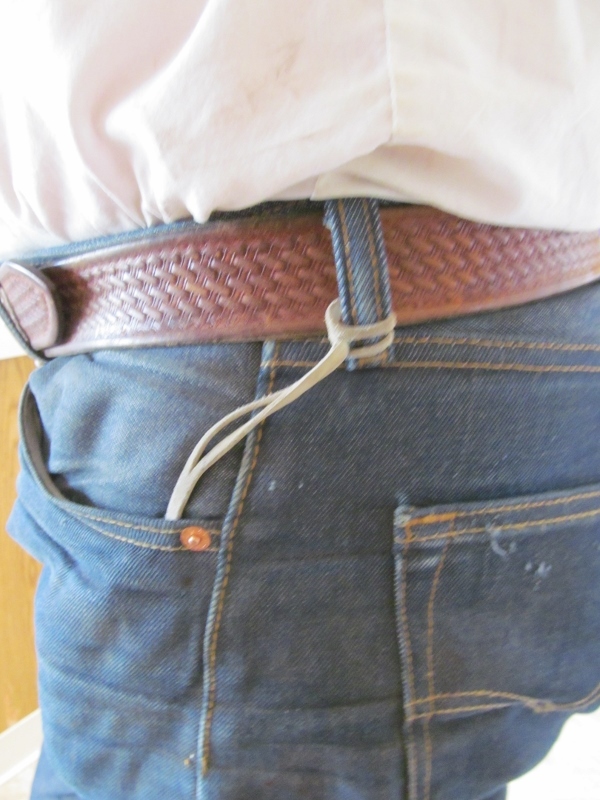 Buckaroos carry theirs in a small leather sheath attached to a belt loop by a thin leather string. 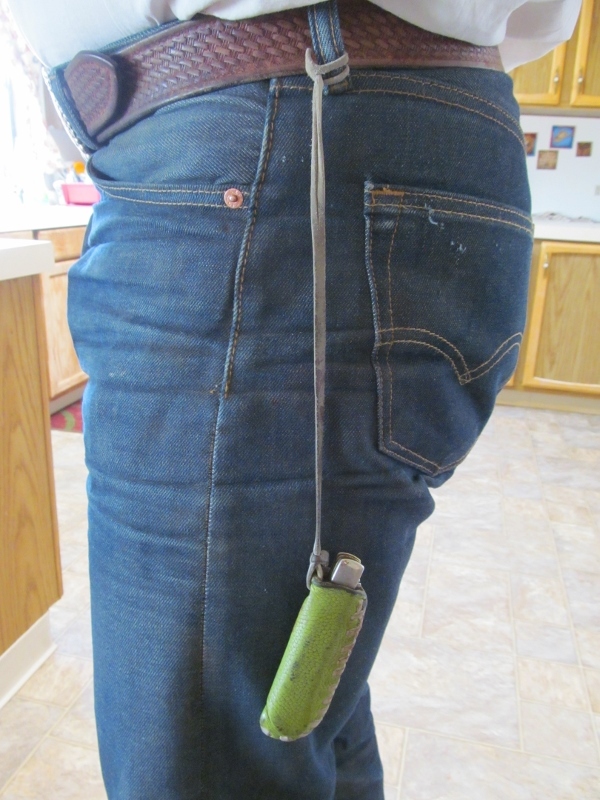 During branding or other times when they’re using their knives frequently, they’ll often leave the knife dangling by their leg instead of putting it back inside their pocket each time. Belt by Tip’s Western Wear, jeans by Levi’s, knife sheath by Jim Young, well-toned backside by miles and miles of trotting. Jeans: Buckaroos wear all the main brands, such as Levi’s, Wranglers, Cinch and Stetson. This one is entirely personal preference, and there is no one-brand-fits-all. A few go old-school and buy a pair of shrink-to-fit Levi’s and never wash them. Instead, they wear the jeans until they wear out or walk off on their own accord, either to find a washing machine or a place to die. Leggings: The stereotype is unavoidable; most buckaroos wear chinks 365 days a year, but the styles vary widely. Some go all-out fancy with neon colors and sewn-on fringe in a contrasting color, while others stick with more neutral earth tones and regular fringe. 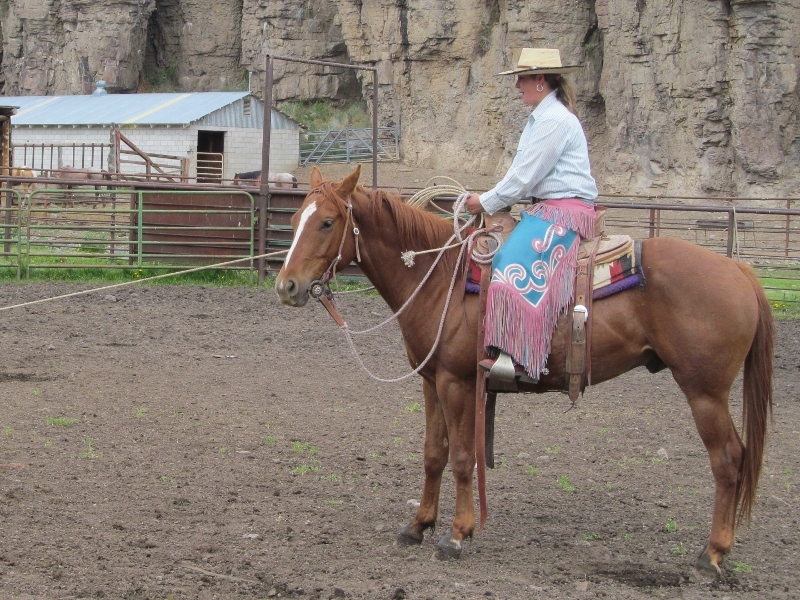 Here, the ultra-talented Anna Severe of Rogerson, Idaho holds the rope tight at a Diamond A branding while sporting a pair of chinks she made. My chinks are much plainer (or “classic,” as I prefer to say) and also made by Mrs. Severe. Photo by Becky Kingen. If a guy can afford them, he definitely has a pair of woolies in his gear collection. 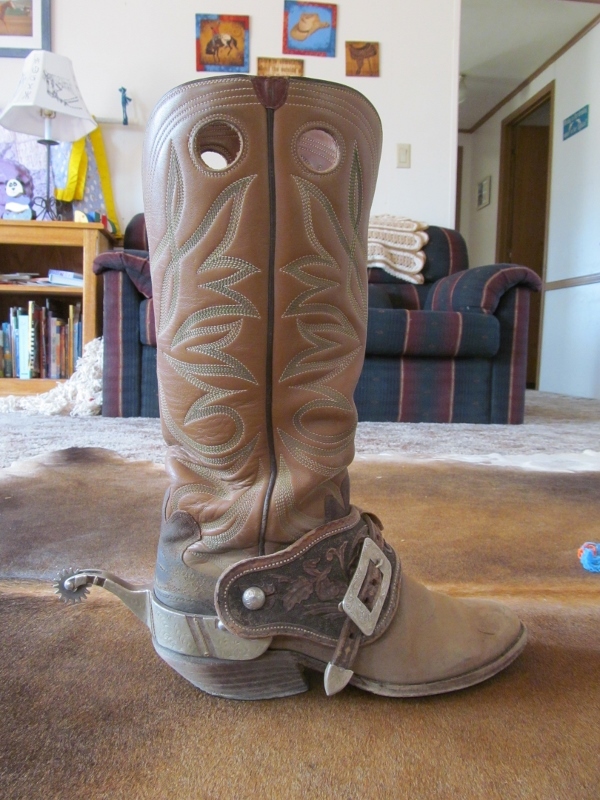 One pair should last his entire cowboy career, as he might only wear them a few days or weeks each winter. They’re spendy but worth the money, because when the daytime high is 20 below, he will be much warmer than his chink-clad comrades. And if the temperature warms up a little, well, you sure won’t hear the woolie-wearing vaquero complain about sweating a little while riding in the pickup. In fact, he will probably brag about it. Can you pick up on my home decor theme here? 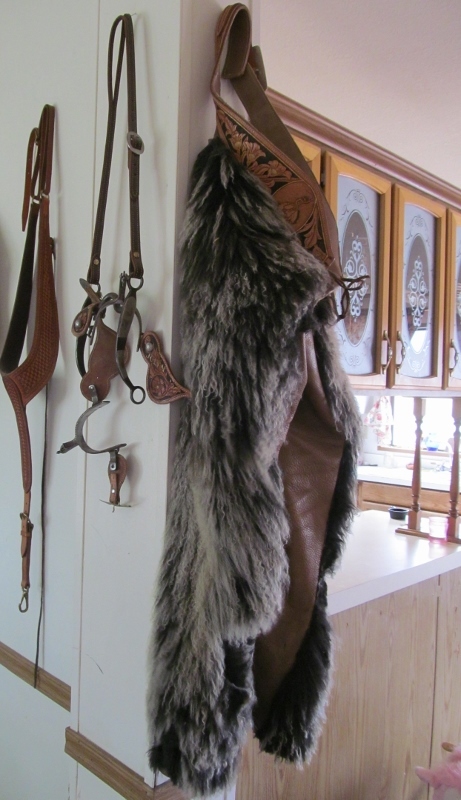 I call it “Welcome to the tack room.” Jim’s mom, Beverly Young, made these beautiful woolies. Boots: The tall tops and high, underslung heels that most people associate with the buckaroo stereotype are…actually fairly common. Paul Bonds remain popular, as well as boots made by Battle Mountain’s Kelly Martin. A lot of guys wear cheaper crepe-soled work boots they call “lettuce pickers” for chute work or the cold months. It would be fun to take a survey to know how many people consider themselves buckaroos these days. what happened to “Olathe Boots, Dahl spurs, Wrangler jeans, Frank Hansen rawhide, Hirt lid and a old Garcia spade ???? and any good carved wood as long as it wasn’t from Cap’s………. Good article. Two things I’d a done differently if I had stayed in the life—Goggles or sun glasses for the snow glare and wool pants instead of Levi’s. Todays cowboys have such a variety of good winter clothes and boots to choose from. All we had were rubber overshoes with either lace up or buckles, leather or rubber gloves, warm coats and slickers. No cowboy hats or spurs in the winter. What part of the country are those spurs from? There are some that say the Riders cowboy boot must have a heel to prevent the Riders foot from going all the way through the stirrup. Have you heard of anyone having their foot go through the Stirrup while wearing the lettuce picker boots? Nice words…mind telling a California boy what long-handle season means? Sure, long-handles are another term for long underwear. What part of California are you from? I’m originally from Siskiyou County. Oh, well, that makes a lot of sense. I’m from Butte county, and as you know, being from Northern CA., we don’t have a season for long-handles, but maybe a couple of DAYS. Thanks for sharing your life and experiences, it’s nice to learn new slang and hear how folks are doing things in other parts.